It starts to get light about 5:00 a.m. and the roosters commence their competition to welcome the new day. Who can crow loudest? Longest? Most Inflections? The birds join in with a songfest and soon we hear the occasional bark of dogs as households begin to stir and take advantage of the cool morning temperatures to get some chores accomplished. A baby wails, a child laughs, a new day begins. We can go up to the third-floor rooftop terrace and peer over the waist-high railing into our surrounding neighbor’s irregularly shaped dirt yards filled with an outdoor stove for cooking, various shade trees, the occasional mango, and the ubiquitous banana trees. Drying clothes hang from lines and, in a haze of suspended dust, the women sweep the hard dirt backyards clean of leaves and place the debris into a trash pile with other discards to be burned every few days. The funky odor of burning trash and other garbage wafts into our window occasionally. 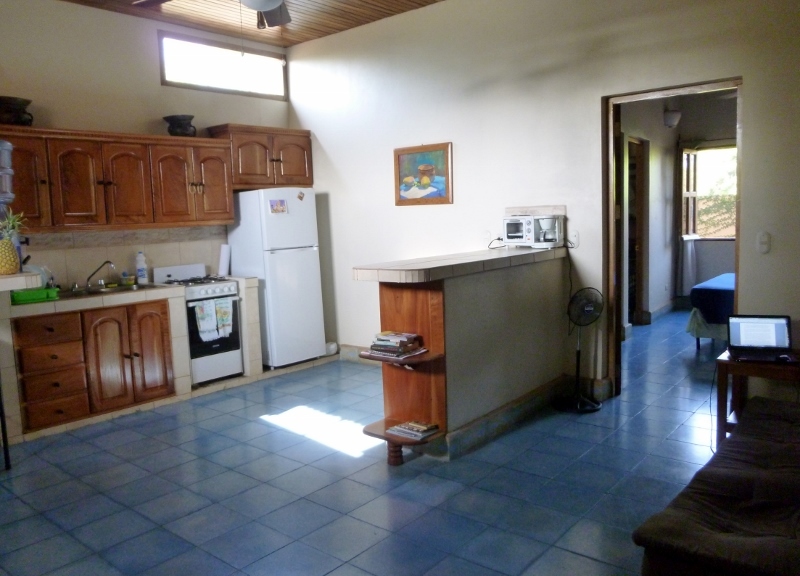 We are renting a cheerful, airy, one-bedroom apartment, about 500-square feet, at the Vista Mombacho Apartments. 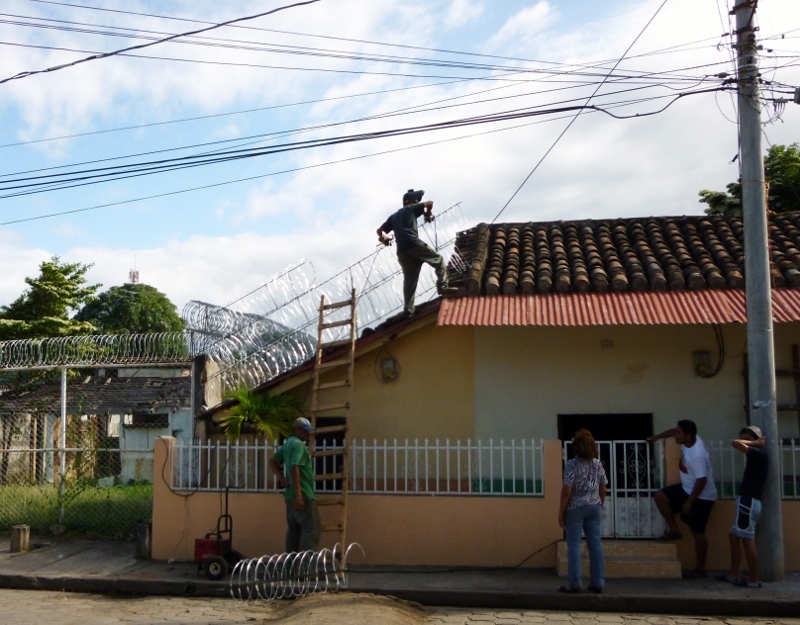 We have doormen who monitor the entrance around the clock for security and keep an eye on the neighborhood doings. A small staff makes certain that maintenance problems are promptly fixed, the apartment cleaned twice weekly, the 5-gallon bottles of drinking water replaced as needed and our questions answered as they arise. The laundry facilities are clean and the Wi-Fi, while not blazingly fast, is reliable. And, oh yes, there’s a lovely pool to float around in during the heat of the day and a roof-top patio for get-togethers or star-gazing while relaxing in a hammock. As for the neighborhood, zoning is a first world concept and “mixed” would most aptly describe the area. 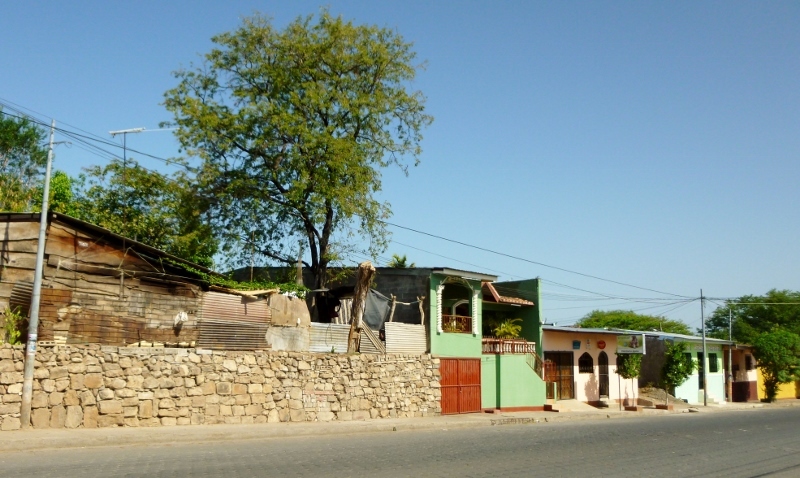 The predominant style is colonial with the attached dwellings fronting the walkways and/or road and finished in a stucco facade. Some homes are well-maintained with freshly varnished doors and a gleaming coat of paint. Some are a little shabby and some are in uncared for, dilapidated disrepair interspersed with the occasional empty, trash-strewn lot. Mixed in with the houses are pulperias: small, family run stores in the front of the home specializing in convenience items and groceries, homemade foods and drinks, bicycle or small appliance repair shops, etc. Many mornings we’ll glimpse the neighborhood women here and there busily scrubbing down the walkway in front of their homes or businesses. At various times of the day, groups of men (varying in age but all unemployed) will congregate to visit or pass around a bottle. Occasionally, as you walk a few blocks in any direction, will be some prone, passed-out man sleeping off another day of no work, no hope. 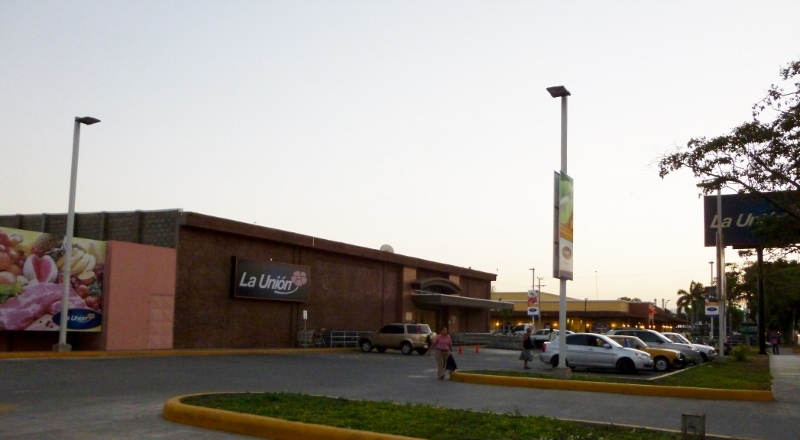 The two grocery stores we shop at, La Union and La Colonia, are about four blocks from our apartment. Every couple of days we grab our canvas bags and set off. The stores are surprisingly westernized with shopping carts, scanner check-outs, and US and Latin American brand names. The familiarity and ease of shopping is reflected in the increased pricing. We attempt to economize by buying some of our fresh fruits and vegetables in the small markets around the city or the mercado but the habit of convenient one-stop shopping dies hard. 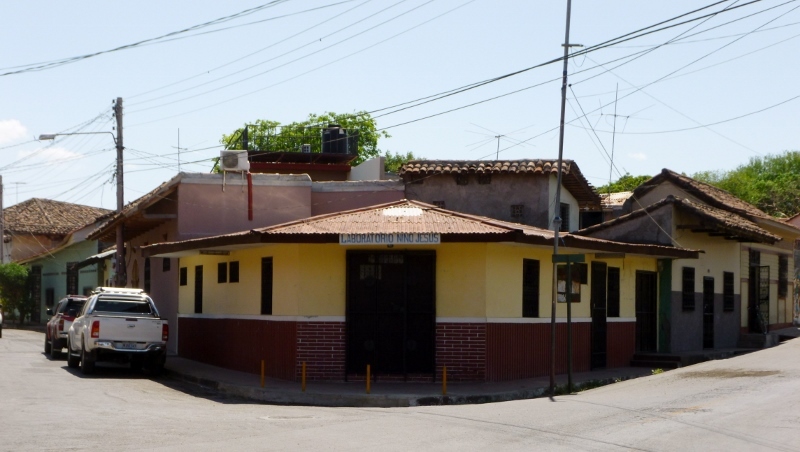 Elsewhere in the neighborhood, just a couple blocks down from the grocery store is the office of our physician, Dr. Francisco Martinez Blanco, who speaks fluent English and enjoys a popular reputation in the expat community. In the other direction is the Laboratorio de Diagnostico Clinico Jesus Christo known to expats as “The Baby Jesus Clinic” where you can get your lab work done. Two blocks further on is a husband and wife dentist team, both fluent in English and trained in Argentina, who run a spotless, modern and well-organized office and personally performed our bi-annual cleaning and dental checkups at a fraction of the cost of work in the US. It’s not hard to find fault in any city if you’re looking but Granada, a beautiful little city, is easy to love and easy to feel at home in. There’s plenty to do and see in the area for those so inclined or there are many places to relax and while away an afternoon. Parting company with the city and continuing our travels at the end of April will be difficult. Hi Anita: I found your post very interesting. A friend and I rented a small apartment in Quito a couple of years ago while I was researching chocolate and I found the lifestyle to be very interesting. How much English is spoken in Granada? And may I ask how much you paid for the place you are staying? I’m definitely looking at ways to get away from winter forever at some point in the future. Hi Doreen – So glad you like our post! Granada seems to be a very popular place for people wanting to escape the cold weather and has a rapidly growing, very friendly and welcoming, active expat community. In the 4 months we’ve been here we feel completely at home (and it will be hard to say goodbye to the many friends we’ve made). As for our apartment, we’re paying $699/mo with utilities added as extra since electricity is very expensive here. We have friends who are renting lovely, fully furnished homes for about $1200 per month and also have friends renting apartments for around $500. As you can see, it’s a wide range of prices but definitely affordable by US prices! So glad you liked the post of our neighborhood. The baby Jesus clinic nickname tickled my sense of humor although I guess it’s can be viewed as a wish for continued health, too! It’s fun to walk around and try to describe a place that’s so different from the US. This is always the first thing I want to know about whenever we go to a new city. I love the colourful buildings! We love walking around the city and admiring all the colorful homes and buildings, too! Nice looking town – I could hang out somewhere like that – how far is the beach? Hi Lis. There are several beautiful beaches on the Pacific coast only a couple of hours away from Granada. It’s a beautiful town to visit and, evidently a lot of people besides us love it, because the expat community is growing rapidly! So glad you liked the tour, Noel. We love Granada and it’s been an easy city to settle into temporarily and make friends with both the local and expat community. 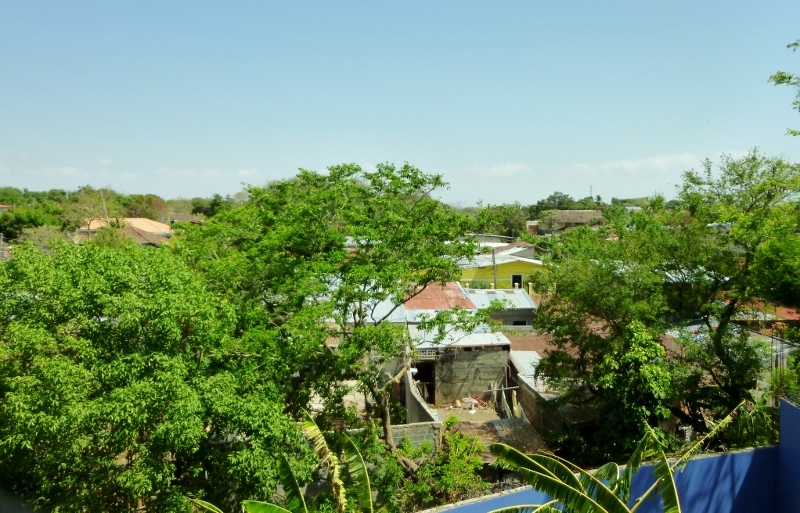 There are a lot of amenities here: good restaurants, shopping and first run movies in Managua, and beaches on the Pacific coast just a couple of hours away that make this city an attractive place to consider settling in some day when we slow down on our traveling. Always enjoy your posts. I am now considering Granada for a destination. Thanks, Mark. Granada’s a great choice to either live or visit. 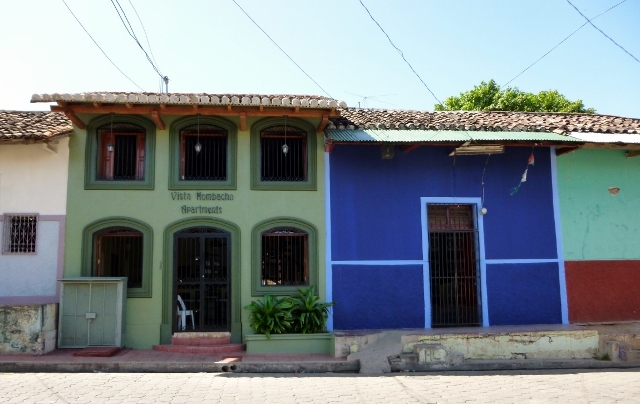 We’ve moved it to the top of our list as a possible place to settle down in the future.The people here are great, it’s very affordable and quality health and dental care is readily accessible with world class healthcare only 40 minutes away in Managua. The place sells itself without even trying! Hey Ed & Marlene – Wish you were here, too. Feels like we’ve become a part of Granada and it’s going to be hard to say goodbye…Just a few more weeks and then we’re off for Costa Rica followed by Panama. Time to make some plans for a meet up in the fall or winter again, don’t you think? Great story! I love your apartment. I’d live there if I could. My style for sure. Now, Maida REALLY knows where to meet you! NYC????????? Helllllllloooooooo!!!!!!!!!!!!! I’d love to meet you there, but you’re probably so used to frugality I’d have to sneak off to 5th Ave alone. It’s so good as always to hear from you. Glad you’re doing so well, I’m truly happy for you. Hey Chris! I don’t know if we’re as frugal as you think we are but having to carry everything with us when we pick up and move on to the next destination definitely keeps us in check! Good to hear from you. Granada is like none other….. the people, the warmth and so serene in so many spots. I am in the process of creating a video but at the moment, I have something on facebook(spmaida@optonline.net ). I am looking forward to connecting with you once you hit the East Coast and ready to see New York City and/or Long Island. You’re so right, Maida. 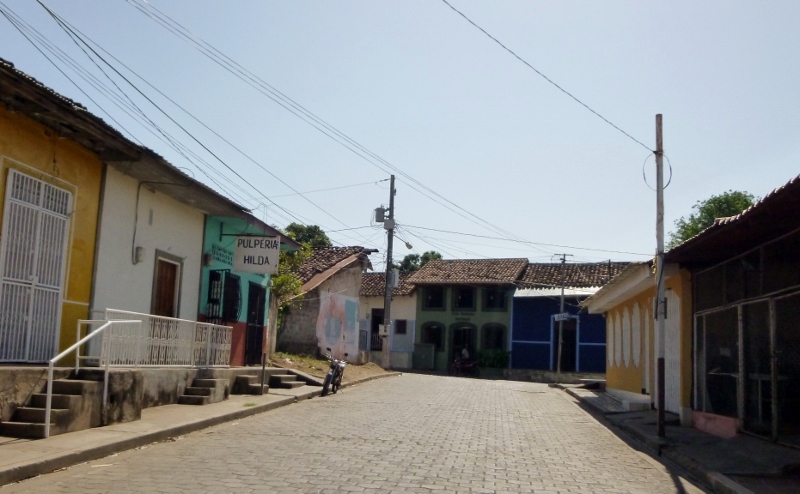 Granada and its people are really special and our time in Nicaragua has been amazing. Now that we’re done volunteering we plan to do a little more exploring before we pack up and move on. Looking forward to your video!